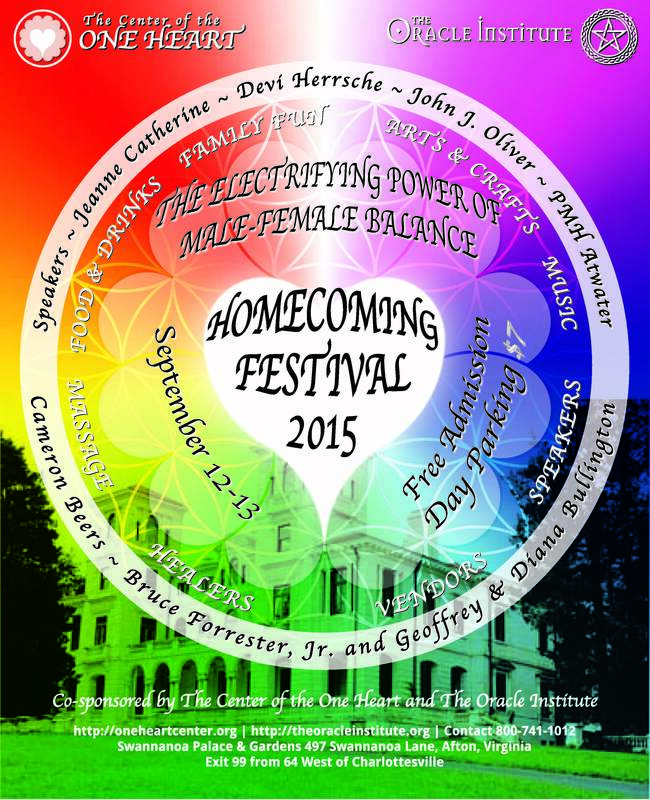 On September 12 and 13, 2015, The Center of The One Heart will host its annual Homecoming Festival at Swannanoa Palace & Gardens on Afton Mountain, Virginia – the former home of Walter and Lao Russell and their University of Science and Philosophy (www.philosophy.org). 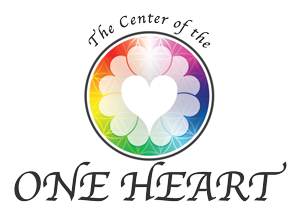 The Center of The One Heart (www.oneheartcenter.org) is a Central Virginia based non-profit educational corporation serving as a networking and support organization for teachers, healers, and artists in the greater Central Virginia area. You are invited to attend and participate in this weekend of celebration, ceremony, music, and entertainment. This year our annual Homecoming Festival is again co-sponsored by The Oracle Institute (www.theoracleinstitute.org), a 501(c)(3) educational charity, and donations are being accepted to support this event at www.theoracleinstitute.org/one-heart. At last year’s homecoming the focus was on living the message of love given to humanity by cosmic illuminants Walter and Lao Russell. This year we will be focusing on the life and work of Lao Russell, the power of the divine feminine, and women’s freedom, including the need to bring our lives, culture and society into balance through the electrifying power of male-female balance. Together we will explore the practical application of the power of love in action not only by examining the life, work, and teachings of Walter and Lao Russell but also by examining the power of achieving our inner male-female balance so that we might replicate outwardly the power of our inner male-female balance to create balanced relationships with our partners, friends, family, and community. You are invited to answer the call to receive a newer and deeper power of the heart that will enable you to move forward beyond your limitations into a new reality and take your wisdom and power to new levels that will allow you to be a true custodian of the planet and its future. This gathering will present a powerful opportunity for us to come together in our collective heart and to tap the power of love in action, divine synchronicity, infinite intelligence, and the powerful connectivity that comes from awakening and moving into our deepest encoding and purposes for being on the Earth. This year’s festival will include speakers, food, music, and vendors of metaphysical books, art and jewelry, as well as various practitioners of massage and bodywork and healing modalities. Anyone wishing to reserve a space as a vendor should contact our vendor coordinator Marge Thompson at (845) 866-4395. There is no fee for being a vendor, however, you are requested to re-give to The Center of the One Heart from the proceeds of your sale of services or products. With a great mix of speakers, music, and vendors, this event will offer an opportunity for networking, fun, and celebration as we come together as one mind, one heart, and one family in a divine moment in time and space to open a portal for greater heart energy to anchor on the Earth. This event is Blue Pot powered, meaning that the event is paid for by the participants on a donation basis. This event is offered free from the Heart and you are welcome without regard to your ability to support this event financially. You are asked to support this event financially in accordance with your means, thereby unlocking for yourself the secret of abundance as your giving will be re-given through increasing abundance in all aspects of your life. Due to limited parking at Swannanoa Palace there will be a $7.00 daily parking fee for those who choose to park on the palace grounds. 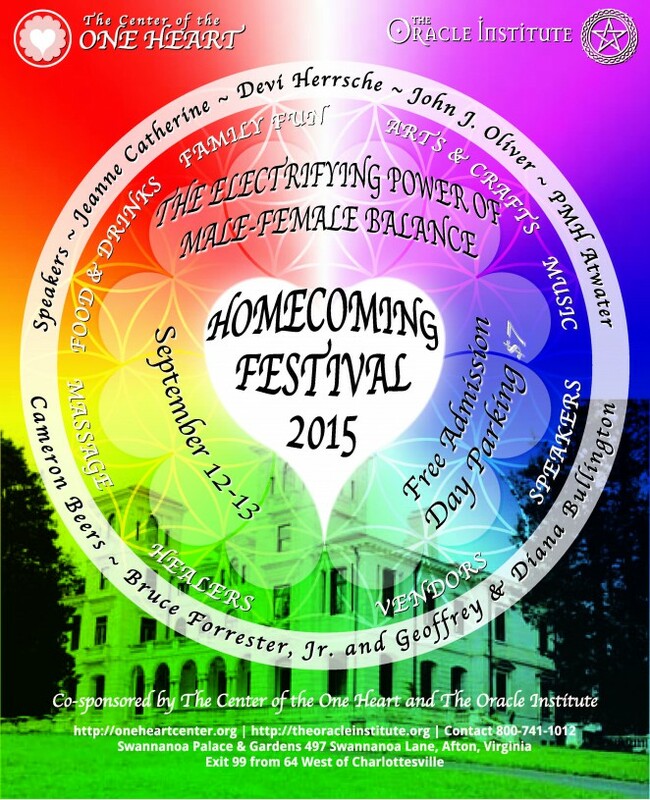 If you are from out of town and are considering attending the Center of the One Heart Homecoming Festival 2015, please reserve a hotel room immediately as there are many events going on in the area the weekend of September 12-13, 2015, and the availability of hotel rooms is already limited. Located on sacred geomantic terrain, Swannanoa Palace is aligned with the Cygnus constellation, Cygnus being the celestial swan. All are welcome to glide with the celestial swan across the lake of light and pure consciousness as we unfold the renewal and re-awakening of the Christ mysteries on Afton Mountain. Swannanoa Palace and Grounds was originally created in the early part of the twentieth century by Major James Dooley of Richmond, Virginia, a railroad magnate. After his death, Swannanoa was operated as a country club and then fell into ruins throughout the Great Depression. In 1944, Swannanoa was purchased by Skyline Swannanoa, Inc. and was briefly operated as a tourist attraction before the property was leased in 1949 to Walter and Lao Russell who for over fifty years operated The University of Science & Philosophy from Swannanoa Palace. After the departure of The University of Science & Philosophy in 2001 from Swannanoa, the Center of The One Heart incorporated as a non-profit organization meeting often on Afton Mountain to celebrate and network. In 2015, Swannanoa Palace & Grounds will again be open to a large scale Homecoming event for light workers to come together in a mystery drama and sacred weekend of fun, laughter, and sharing. All are welcome to celebrate at the altar of the swan and to enjoy the magic and pure consciousness of a sacred site and vortex which will be magically re-opened again on the weekend of September 12-13, 2015. We are pleased that Jeanne Catherine, will be a speaker at this year’s Homecoming. Jeanne Catherine is the founder of divine play three principles training center in Charlottesville, Virginia, (www.divineplay.com), and she is a mental health educator and innate health advocate, certified as an advanced transformative coach, certified three principles practitioner, and currently studying interdisciplinary mental health at Leslie University Graduate Program. Jeanne has twenty years’ experience working with groups and her integrity, warmth, presence, and skill are remarkable. Her willingness to go straight to the heart of the problem and not be afraid of anything puts her in a unique position for guiding leaders. The title of her presentation is “Quiet Mind, Loving Heart: Cooling the Flames to Light the Fire”. Jeanne will explore the birth rite of all human beings—freedom of mind, and will present simple truths about how the mind quiets down and how to uncover your birth rite as an easeful and loving human. John J. Oliver, a member of the Center of the One Heart circle of leadership will be speaking about “the power of love”. John was a friend of Lao Russell in his late teenage years, and is one of America’s premier psychic intuitive living in New York City. He has an extensive background in psychic police work, ghost investigations, personal readings, and starred in the court TV series “Haunting Evidence” and “Door to the Dead”. Known for his amazing accuracy and uncanny insight, John has worked professionally as an in-demand psychic and spiritual teacher since his teenage years. In Virginia he owns the Aquarian Bookshop and the Aquarian Crystal Gallery in Richmond, Virginia, and the International Black Belt Center in Charlottesville, Virginia. John teaches people from all over the world about subjects of meditation, consciousness, mysticism, wisdom school traditions and intuitive development. For further information about John Oliver, please visit www.johnjoliver.com. Bruce M. Forrester, Jr., a scientist from Ohio will be giving a presentation entitled “the science of male-female energy”. Bruce is the founder of Zephyr Technology (www.zephyrtechnology.com), focusing on technology for the new age. His research has involved replicating some of the “free energy” discoveries of Wilhelm Reich, M.D., Nikola Tesla, Nathan Stubblefield, Edward Leedskalnin and Henry Moray, with influence from Walter Russell. Bruce will offer insights on male-female balance from a scientific point of view. Devi Herrsche (quadernity.com), will be speaking about “exploring gender roles on universal, cultural and personal scales”. She will examine how gender roles throughout the ages have both been exploited and exalted, and will explore gender roles from the universal, societal to personal. Devi joined our One Heart soul family at homecoming in 2013 and has been a huge contributor to her long lost tribe, actively participating in the life and work and events of the Center of the One Heart. Geoffrey and Diana Bullington will speak on the topic: “THE ELECTRIFYING POWER OF MALE-FEMALE BALANCE.” Geoffrey and Diana are spiritual cosmologists who have been involved in the exploration and expansion of universal, planetary, and human consciousness for over thirty years. By combining the tenants of science with religious and philosophical belief systems, they have merged a set of universal principles into a living philosophy titled “Practical Spirituality in Everyday Life.” For further information about Geoffrey and Diana please view their videos at www.youtube.com/spiritualharmonics1. PMH Atwater, a founding member of the Center of the One Heart from its inception in 2000, will be offering a presentation entitled “My Personal Journey of Opposites”. She will offer insights and lessons learned from her 35 year marriage to Terry Atwater and their shared journey on the earth. Information about PMH Atwater can be found at www.pmhatwater.com . PMH Atwater, L.H.D., Ph.D. (Hon) is one of the original researchers in the field of near death spirit studies, having begun her work in 1978, she has written eleven books on her findings, her 11th- involved Dying to Know You: Proof of God in the Near Death Experience . She is a visionary whose insight and research are on the cutting edge to the beginning of a massive change in the old spiritual and scientific paradigms taking place now. Cameron Rogers Beers will be presenting “AKASHA GNOSIS: BIRTH OF THE DIVINE CHILD”, gnostic teachings from his personal love story, the journey of life growing up and recently becoming a father. Cameron will be speaking about the power of +/- balance in the mythology of creation, esoteric science and universal symbolism, as well as modern science, cosmology, astrology, numerology, popular culture, movies, and channelled materials. Other topics include the role of knowledge in society, the matrix, our esoteric future and the secret truth behind many of the greatest mysteries on Earth. This will be a personal and dynamic slideshow presentation! Cameron has been volunteering for the One Heart community for 5 years helping with their website and media production; he lives with his wife Jessica and newborn Aria Sofia in Charlottesville Virginia. More at http://cambeers.com. On Saturday evening of the Homecoming Matt Venuti (www.mattvenuti.com) will present a concert at 7 p.m. Please take a moment and go to his website to sample his deep heart musical path of sharing and connection with the family of the one heart. You are also encouraged to go to www.youtube.com and search for Matt Venuti’s current tour and song Rise, which will give you a taste of the treat in store at his concert. Because his concert creates a sacred meditative experience, the doors to the palace will be closed when his concert begins, so please plan on arriving promptly. Our own Maia Joy Oden and Jasper Burns have kindly agreed to open for Matt Venuti with a short set of original songs written by Maia Joy Oden. We are grateful to Maia and Jasper for contributing to the Saturday evening entertainment at Homecoming. On both Saturday and Sunday during the lunch break there will be several garden workshops. On Sunday, Laura George, Founder of the Oracle Institute, will offer a presentation entitled “The Secret Destiny of Virginia” and Elly Appel will be presenting a yoga workshop. All are welcome to celebrate and enjoy the experience of heart consciousness at a sacred site and vortex in the company of other light workers and spiritual seekers. If you would like to know more about this event or volunteer as a staff person for this event, please contact Richard at (800) 741-1012 or Airisun at (434) 823-9911, or email us at centeroftheoneheart@gmail.com. Advance donations to support this event will also be gratefully received and may be mailed payable to “The Center of the One Heart” at P. O. Box 511, Culpeper, Virginia 22701. You may also make a tax-deductible donation to support this event through our co-sponsor The Oracle Institute by clicking the donate button at www.oneheartcenter.org or by going to the landing page on the Oracle Institute website at www.theoracleinstitute.org/one-heart. Please carpool if possible, and bring a chair, pillow, or blanket. The entire weekend event will be broadcast on local radio so be sure to bring a walkman radio or boom box so that you may hear the speakers and the music even if you are not in the Baronial Hall of the Palace. You are invited to tap the power of the heart by gathering, co-creating, celebrating, breaking bread together, dancing, singing, and laughing together as we embrace our spiritual community, our circle of light, and our collective expressions of the Heart of the One.